Sergioz82 1 year, 9 months ago. Here is the much awaited Nougat 7.0 ROM for Galaxy S4 Mini CyanogenMod 14 (CM14). We also have the Lineage 14.1 for Galaxy S4 Mini. For latest updates, stay tuned to the Lineage OS device list page. Since Google released Android Nougat Source code, we have update many Android NOUGAT AOSP ROMs and also many CyanogenMod 14 ROMs updated and many are yet to come. 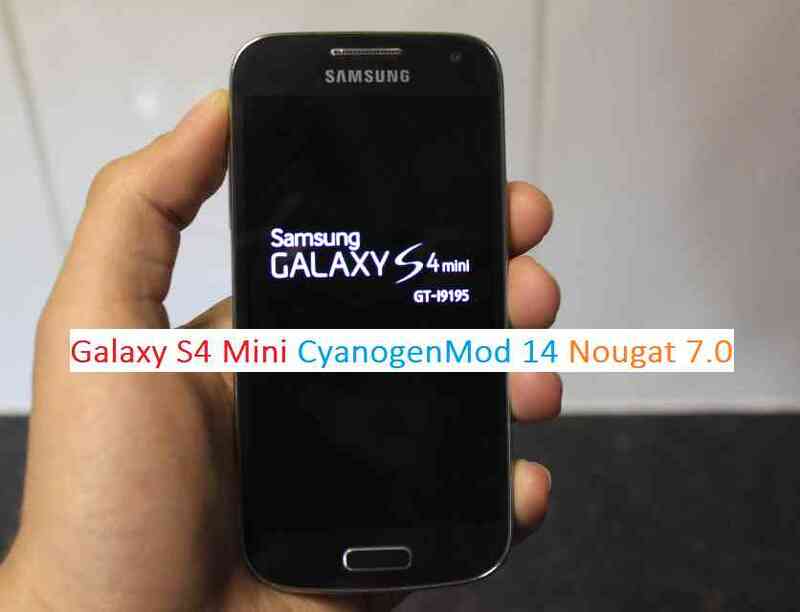 This Galaxy S4 Mini for CyanogenMod 14 is brought to you by developer csendre. Download and Copy the GApps and Galaxy S4 Mini CyanogenMod 14 ROM ZIP to your phone. Reboot and Enjoy the CyanogenMod 14 Nougat ROM on Galaxy S4 Mini. Copy the latest Galaxy S4 Mini CyanogenMod 14 ROM ZIP file to your phone. Hi! This ROM is only for S4 Mini at the moment? I mean it isn’t work with LTE or other models? This ROM is only for S4 Mini. Here is one Galaxy S4 Mini LTE CM14 (CyanogenMod 14) Nougat 7.0 ROM. The linked ROM is for S4 Mini LTE US Cellular. I’ve installed the ROM and everything works fine except bluetooth: now I can’t connect anymore to my car android radio (Eonon with kitkat 4.4). I read that this is a common problem with Nougat. Basically I can pair the device but it connects for a brief moment and for couple of times, then on my phone BT tab I read: “Eonon (Phone excluded)” and for the car radio the phone isn’t even connected. I did some online researches but the situation is not clear: has someone managed to fix it? Does a patch exist? has someone managed to fix it? Does a patch exist? If this is a known issue with Nougat then this might be fixed by now. Just to remind you that CyanogenMod is dead from development point of view. LineageOS is the new name of CyanogenMod and hence I strongly recommend you to move to the Lineage OS 14.1 for Galaxy S4 Mini. yes, I’ve read about the new Lineage OS, but I decided to use CGM 14 because I wanted something more tested and stable. Moreover the problem I mentioned has been solved by Google with Nougat 7.1.2 but for the moment Lineage releases are based on 7.1 (please correct me if I’m wrong). Anyway, for the moment I reverted my phone back to original Samsung ROM so car stereo works fine again. I think I’ll wait some further improvements in Lineage before installing it.